5. The great sense of nostalgia only a push mower can provide. 4. Push mowers start every time. 3. Small lawns don’t need a power mower to make them look good. 2. Better for the environment. 1. Get a great work out while caring for the lawn! Pros: Blades really cut the grass (instead of breaking off the grass blades like rotary mowers do), environmentally friendly, great source of exercise, the easiest mower to store in your garage. Cons: Sharpening costs tend to be higher, mulching is not an option, a certain degree of physical conditioning is needed to get the job done, lawn debris ( twigs) can get caught in the mower blades and cause sudden stops. The Reel Push mower were made for those folks that take their lawns seriously - very seriously! Consider all the golf courses around use a power reel mower to trim the putting greens. Maybe you want your lawn to look as good as a putting green, too. What makes this mower so unique? The rotating blades of the reel traps the grass, and cleanly shears every blade against the bed knife the same way scissors cuts through paper. This cutting action is much more efficient than a rotary mower, where the grass blades are often “broken off” by the spinning blade under the mower deck. The result is a much more professional looking lawn. The first truly mechanical mowers were of the reel design, so the idea has been around for more than 100 years. The push mower of the post World War II era was durable, affordable, and a fixture in almost every American home with a lawn. Many of these decades-old machines can still be found in garage sales and in storage sheds, and still perform admirably with a little maintenance. 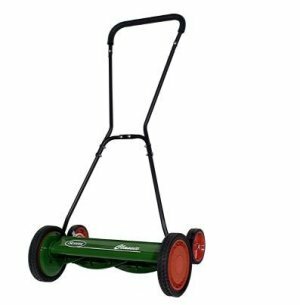 Although the reel push mower was once an American Standard, it has fallen in popularity. There are few manufactures of these great machines left. Sears remains a great place to find reel push mowers at a good price. At the heart of any reel push mower is the cutting blades on the reel. As a rule, the more blades on the reel, the more expensive the mower. The range for blade number is 4 to 10. Are more blades always better? Not necessarily. A higher number of cutting blades allows for more grass to be cut as the mower moves forward. The more cutting blades, the faster the mower can move, and still cut the grass properly. More blades also translate into smaller areas of grass trapped between the blade and the bed knife as the blade turns. This should provide a more even cut. This is accomplished by moving the rear roller ( or rear wheels) up or down. As the roller is moved lower, the bed knife is lifted farther off the lawn, cutting the grass higher. Most reel mowers cut as low as one quarter inch, with some models adjustable to 3 inches high. In many wetter parts of the country, a low cut lawn thrives well. For those living in a dryer climate ( like the Rocky Mountain west) the Kentucky Bluegrass prefers to be longer, since a short trimmed lawn will need to be watered much more often to keep its good appearance. Behind the cutting blades of any reel mower, you will find either a roller or set of wheels. This serves to give the mower balance, and allows an adjustment to set the cutting height. Traditionally, rollers were used. Stable, simple, and durable, the original rollers were made out of hardwood. The newer designs incorporate a hollow plastic or composite roller, which helps reduce weight. The majority of push mowers continue to use this design. Some models ( such as the Scotts Classic) have abandoned the roller for a set of small wheels in the back of the mower. On theory, this could allow for better maneuverability, and reduce the weight even further. A push reel lawn mower is designed to either have slight contact between the rotating cutting blades on the reel, or have no contact. The ‘no contact’ mowers allow the cutting blades to come within a whisker of the bed knife. This allows the efficient cutting of the grass, while allowing several benefits in the process. The mower may be a little easier to push, since there is reduced blade friction. The mower is generally quieter ( hence the name ‘silent’). The blades generally last longer between sharpenings, since there is no metal to metal contact. In contrast, ‘contact’ mowers tend to be less expensive, are a little harder to push, and need more frequent sharpening. Eventually, even the best reel push mower will need some basic maintenance, to include blade sharpening. A reel mower is a complicated thing, in a way. All of those spinning blades that come in contact with the bed knife are a bit intimidating. This is definitely not a job for a hand file or a bench grinder! The professionals sharpen the reel and the bed knife using a specially designed grinder. The cutting reel is removed from the mower, and each blade is ground to a sharp edge. The design of the grinder ensures each blade has the same amount of metal removed as the other blades on the reel. In this way, a smooth consistent lawn is assured. Professional sharpening is usually not for the homeowner. There are few shops around in most areas that have the type of equipment needed to get the job done. Cost is also a factor, since sharpening a mower this way is very labor intensive. There are many sharpening kits designed for the weekend warrior. All have one thing in common - the reel us turned backwards as an abrasive compound is applied to the cutting blades. The dull edge of the blades is gradually removed by the abrasive compound, and the critical spacing between the cutting blades and the bed knife is maintained. Once the blades are deemed sharp, the abrasive compound is washed off, and the reel is adjusted and oiled if needed. The mower should be ready for several more seasons of trouble free lawn mowing. Now that the basics of Reel Push mower design have been covered, it is time to find the best reel mower for your needs and budget. The lower priced machines may require more maintenance in the long run, due to cutting blade design. Click on the mower brand you are interested in to learn more. Take me back to Reel Type Lawn Mowers from Reel Push Mowers.